Shortly after starting to work with SQL Server Reports (SSRS) and getting a feel for what they could do as singular presentations of summary and detailed information, I started to consider more elaborate systems presenting suites of reports and a customized user experience. 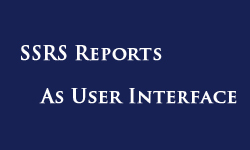 Much of my experience with SSRS has been to present reports through the ASP.Net report viewer control, and that is what sparked my interest in using reports as a user interface. At the onset of a typical assignment I would be presented with the existing work which would be a list of links to an ASP page that would render the report for a visitor. After proving my worth making some alterations and updates to the existing reports I’d be asked to add new reports to the list. This would go on for some time and became rather dry, creating one stand alone report at a time.